Mike Smith celebrates aboard Arrogate after winning the Classic. 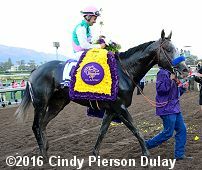 Day two of the 33rd Breeders' Cup World Championships took place Saturday at Santa Anita Race Course in Arcadia, California with 72,811 fans in attendance, a new record for Saturday since the event expanded to 2 days. Conditions were excellent with clear skies, minimal wind, and temperatures in the mid 80's, with the main track rated fast and the turf course firm. The $6 million Breeders' Cup Classic (G1) is the richest race in North America, featuring top older horses going 1 1/4 miles on the main track, in a race that often decides Champion Older Horse, Champion 3-Year-Old Male, and/or Horse of the Year. A field of 9 went to post after Shaman Ghost scratched out due to a fever. 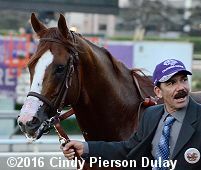 As expected, local hero California Chrome was sent off as the 9-10 favorite off a 5 race win streak including the Dubai World Cup (G1), Pacific Classic (G1), and Awesome Again (G1). In to challenge him incuded 9-5 second choice Arrogate, winner of the Travers (G1), and 8-1 third choice Frosted, winner of the Metropolitan (G1) and Whitney (G1) but a close third in the Woodward (G1) last out. Jockey Victor Espinoza sent California Chrome to the lead exiting the chute and he clicked off fractions of 23.28, 47.15, 1:10.96, and 1:35.72 while 1 1/2 lengths ahead of 17-1 Melatonin and Arrogate. 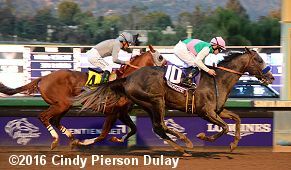 California Chrome looked home free in midstretch but Arrogate, who passed the tiring Melatonin on the turn, steadily gained ground in the final furlong and outfinished California Chrome in the final yards, winning by 1/2 a length in 2:00.11. It was a long 10 3/4 length back to 32-1 Keen Ice third. Left: Arrogate heads to the winner's circle. 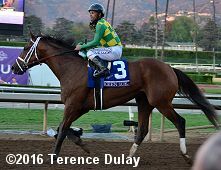 Winning jockey Mike Smith said, "He jumped very well today out of the gate, but was a little reluctant the first probably 1/16 mile. California Chrome had a little bit of company up front of him, so I felt secure that at least he was going to go quick enough, and I didn't have to go after him early and chase him I winded up cutting the corner going into the far turn, and that really helped a lot. He really picked it up at that point, able to get him back outside. Then he was relentless, he never stops. He's got some stamina. The horse has only run five times and he beat California Chrome. That's incredible." 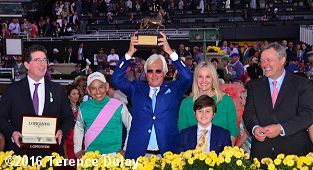 Right: The trophy celebration with trainer Bob Baffert holding the trophy. Baffert said, "Turning for home I thought I'm going to run second, but there is nothing wrong with that, because Chrome is a really good horse, and running second to him is no bad thing. 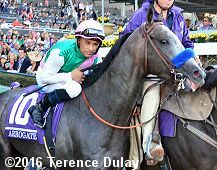 But the 1/8 pole (Arrogate) started getting into that gear, and he's coming, and he's inching away at him. And that last 50 yards, I could not believe. Of all the horses I've trained -- I never thought after losing Pharoah that I thought how are you going to beat something like that. 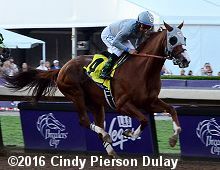 Then to run down a great horse like California Chrome, that's what the Breeders' Cup is all about. Watching races like that. They're just the best. The cream just rises to the top." Left: Arrogate heads out to the track before the race. Right: Arrogate heads back to the barn with his new winner's blanket. Asked about the decision to train up to the Classic, Juddmonte farm manager Garrett O'Rourke said, "(Owner) Prince Khalid has always been a firm believer in hiring the very best and allowing them to do their jobs. He doesn't tell them what to do or how to do it. It's something that I've learned from him as well. So don't believe what Doc (John Chandler) says in me telling Bob Baffert. I don't have to tell Bob Baffert how to do anything. I don't have to tell Mike Smith how to do anything. They're the very best at their profession, and they proved it today. I thank them for it." 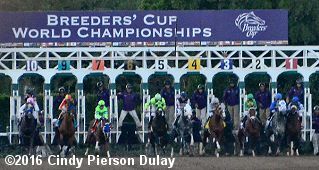 Right: The horses break from the gate for the Breeders' Cup Classic. Winning jockey Mike Smith aboard Arrogate (10) said, "This was incredible today. You just don't see things like this from a young 3-year-old that's only run five times. He literally was prancing after the race was over. Most horses hang their head and have to take a breath or two before they can even turn around and come back after going 1 1/4. He hasn't run in two months and he was literally dancing. The outrider couldn't believe it. He goes, Are you kidding me? This horse is dancing like this? And I said, He's just got air forever."